Aim: To evaluate the occurrence of Hepatitis B surface antigen positivity in family members of HBsAg-positive patients, to assess the profile of HBV infection in them, to identify possible risk factors in a close family environment, and to evaluate the burden of liver disease in these family members. Materials and Methods: All Hepatitis B surface antigen-positive patients who attended the Liver Clinic of the Gastroenterology Department of the Calicut Medical College, from January 2009 to December 2010, were studied. The index case was evaluated with HBeAg, anti HBeAb, HBV DNA, liver function tests (LFTs), ultrasonogram of the abdomen, and alpha fetoprotein, as also liver biopsy in indicated cases. The index patient was interviewed and a detailed history with special emphasis on probable risk factors was taken. All first-degree relatives and relatives staying in the same house of the index case were screened for HBsAg. The relatives who tested negative for the infection were advised HBV vaccination, while the relatives who tested positive were evaluated for disease activity using LFTs, HBeAg, anti-HBeAb, HBV DNA, ultrasonogram of abdomen, alpha fetoprotein, and biopsy as per indication. Results: There were 376 index cases available for the study, 230 males (61.17%) and 146 females (38.83%). Male : Female ratio was 1.57 : 1. Mean age was 32.8 years (range 6-76). Seventy-six persons (20.21%) were detected to be HBsAg-positive during various preprocedural screenings, 42 (11.17%) were detected during medical checkup for jobs in gulf countries, and 30 (7.98%) were detected during screening for blood donation. Among the female patients, 88 (60.27%) were detected during antenatal screening. Ninety-six patients (25.53%) did not turn up after the initial visit. Among the remaining 280 patients, 48 (17.14%) were HBeAg positive. LFT abnormalities were seen in 153 (54.64%) cases. Out of 280 patients, 46 (16.43%) had established cirrhosis and 10 (3.57%) had HCC. Twenty-one cases (7.5%) presented as acute hepatitis. Complete family screening was done for 173 (61.78%) index cases. Out of the 280 index cases, 47 (16.79%) patients were reluctant for family screening. Among the 173 cases whose family members were screened, 95 (54.91%) had at least one family member who was HBsAg positive. Among the 95 index cases with at least one family member affected, 25 (26.31%) were HBeAg positive . On HBsAg screening of the relatives, it was found that brothers were affected in 45 (26.01%), sisters in 33 (19.08%), mothers in 18 (10.40%), fathers in 19 (10.98%), sons in nine (6.08%), and daughters in two (1.35%) cases. Ten (5.78%) index cases had second-degree relatives affected. Among a total of 173 index cases screened, 148 were married and among them 4.72% of the spouses were found to be HBsAg positive on screening. A total of 1115 family members of the 173 index cases were screened, of whom 162 (14.53%) were HBsAg positive. Of the 162 family members who were HBsAg positive, complete evaluation to find the stage of liver disease was performed in 43 family members. Among them 31 (72.09%) had LFT abnormality, four (9.3%) had underlying cirrhosis, and one had HCC. Twelve cases (27.9%) were HBeAg positive. Even though HBV screening was advised for all family contacts of the index cases, there was not much enthusiasm among the patients to get their relatives screened. Conclusion: The occurrence of hepatitis B positivity among family members of HBsAg-positive patients was 14.53% in our study. This prevalence was twenty-eight times more than the community prevalence of HBV infection in our population, which was earlier found to be 0.52% by our group. Brothers and sisters were the most commonly affected group, as against mothers who were positive for HBsAg, only 11.3%. Hence, the infection among siblings and parents may also be due to horizontal transmission. Index cases of 16.79% were totally reluctant for family screening due to various reasons like social stigma, high cost of the investigations, and reluctance to believe that they were having a problem, because they were asymptomatic. In view of the very high occurrence of HBV infection in family members, there is an urgent need for better counseling and vigorous screening of family members, to identify asymptomatic cases in the community and target this pool for curative as well as preventive measures. Hepatitis B virus is the most transmissible virus and is very resistant to heat and chemicals, because of its unique structure. Blood has the maximum concentration of the virus among all the body fluids and the risk of transmission is related to the presence of HBeAg and the Hepatitis B virus DNA level in the blood. In India, about 1-10% of the healthcare workers are HBsAg positive. Healthcare workers, especially surgeons, and laboratory technicians are at a high risk of developing Hepatitis B infection. Transmission from Hepatitis B positive surgeons to patients has been well-documented. However, the risk of transmission from a patient to a surgeon is higher - about 30% - following a needle stick injury from an HBeAg positive individual. In India, there is low awareness among healthcare personnel about Hepatitis B vaccination and its related issues, and there is no health policy in this regard. In relation to the healthcare workers, there is an urgent need to formulate guidelines on HBsAg testing, hepatitis B vaccination, restriction of exposure-prone procedures that have to be performed, the extent to which their serological status can be revealed to patients, implementation of universal precautions, and post-exposure prophylaxis. Hepatitis B virus (HBV) is the most important cause of chronic liver disease and hepatocellular carcinoma in India. During the past three decades, considerable advances in the diagnosis and treatment of HBV infection have been achieved. However, despite the remarkable improvements, medical management for HBV induced cirrhosis, and liver cancer remains unsatisfactory. In fact, it is becoming increasingly clear that as of now, there is no "cure" for hepatitis B infection. Management of chronic hepatitis B has changed considerably; currently, emphasis is in identifying and treating patients at high risk of disease progression since effective antiviral therapy arrests disease progression, reduces complications and can potentially reverse liver damage if given for sufficient duration. The treatment should be initiated with drugs that have high potency and high genetic barrier to resistance, and compliance should be ensured once decision to treat is initiated. Resistant patients are difficult to treat and preferably combination treatment with high potency and high genetic barrier drugs should be used to avoid treatment failure. Close monitoring of both treated and untreated patients for disease progression should be done, and early intervention is required to prevent complications in those who show progression over time. Hepatitis B Virus (HBV) infection is a significant global public health problem. Treatment options that have evolved rapidly over the last two decades have proven to be effective, but clear recommendations regarding the choice of first-line therapy are lacking. With the emergence of pegylated interferon (PEG IFN), conventional interferon has been relegated into the background and has a very limited role in the treatment of chronic Hepatitis B. Pegylated interferon α2a / 2b treatment has been documented to successfully achieve normalization of alanine aminotransferase (ALT) and viral suppression in nearly half of the patients. 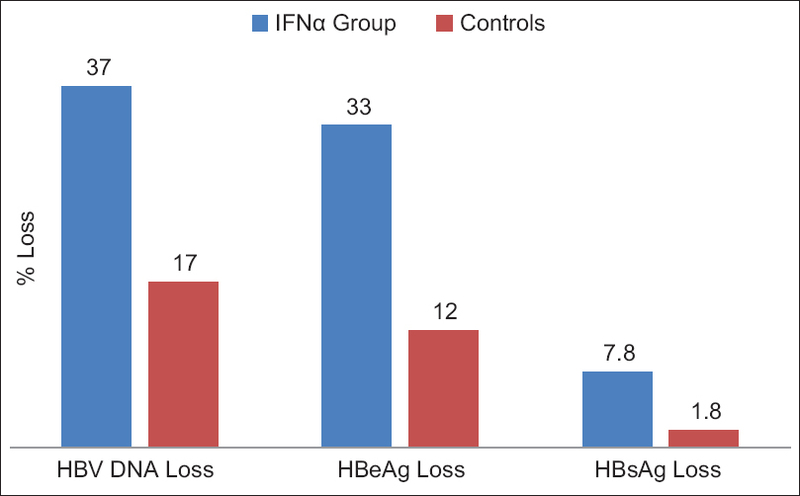 However, HBsAg loss can be achieved only rarely. Combination therapy, comprising of pegylated interferon plus nucleos(t)ide analogs theoretically appear attractive because of the synergistic anti-viral and immunomodulatory actions, but the available present literature does not provide sufficient evidence to recommend the combination therapy. Patient selection is important for tailoring the therapy for patients with chronic hepatitis B. Pegylated interferon seems suitable for young patients with raised ALTs, moderately high viral load, and having Genotype A / B; the advantage being finite duration of therapy and no risk of emergence of drug resistance. The last five years have emerged as a new era in the treatment of chronic hepatitis B (CHB). Advances in therapeutics and the approval of new drugs have been accompanied by a better understanding of the natural history and pathogenesis, as well as better diagnostics. In the treatment of CHB, no therapy has been proven to eradicate the virus completely from the human body due to the persistence of the covalently closed circular hepatitis B virus (HBV) DNA in the hepatocytes. Long-term maximal viral suppression is of utmost importance for the prevention of disease progression and hepatocellular cirrhosis development. Telbivudine is one of the more potent options, with phase III studies indicating its antiviral potency with 6- to 6.5-log 10 copies / mL reductions in HBV DNA levels at year one, comparable to other potent agents such as entecavir or tenofovir. 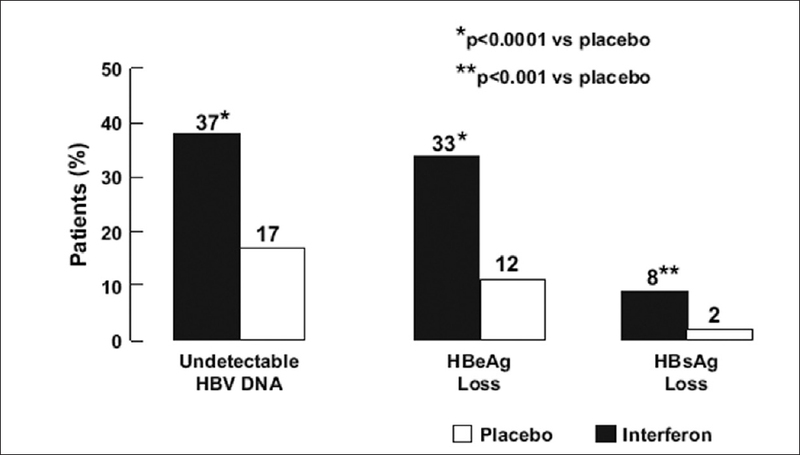 The increasing rates of hepatitis B e antigen (HBeAg) seroconversion were achieved in HBeAg-positive patients during periods of up to four years of continuous telbivudine treatment, and seroconversion was durable in most patients throughout a two-year, off-treatment follow-up, indicating the potential for a finite treatment period in this group of patients. Long-term telbivudine treatment offers effective viral suppression to CHB patients, with certain baseline characteristics and on-treatment virological response. It is also one of the few drugs in the treatment of CHB under FDA pregnancy Category B. Telbivudine is well-tolerated, with elevations in creatine phosphokinase being the most common abnormality observed in the clinical trials. Most often, elevations have been asymptomatic. There are few new drugs for hepatitis B in the pipeline, with the agent farthest along in development, clevudine, halted for problems with muscle toxicity. Future research in hepatitis B will focus on the best ways to use the existing therapies, including telbivudine, sequentially or in combination, in order to maximize viral suppression and minimize the development of antiviral resistance.